500 Social Media Marketing Tips is your guide to social media for business, covering all of the web and mobile's biggest players, including Facebook, Twitter, Pinterest, Google+, YouTube, LinkedIn, Snapchat, Vine, and more! This book provides simply-written expert tips about how to build your brand in social media spaces, attract and engage with customers, and increase sales! As of January 2014, 74% of online adults in North America used social networking sites, and that number leaps to 89% for the 18-29 age range (PewInternet). Annual social commerce sales are predicted to climb to over $30 billion by the end of 2017 (Digitas). Social media users are willing to pay a 21% premium for brands that deliver great service through social networks (Media Bistro). 77% of businesses have acquired new customers through Facebook marketing alone (Marketing Charts). 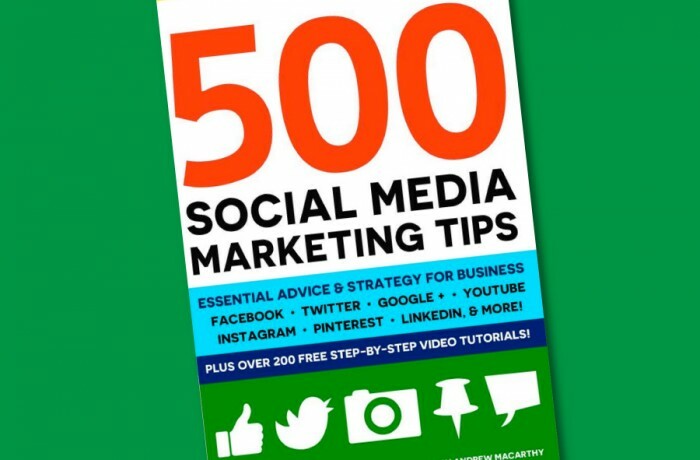 500 Social Media Marketing Tips features advice that will immediately benefit your social media marketing plans, and help you build on them in just minutes per day. Even if you're a social media marketing beginner, why spend thousands on a consultant when you can harbor the power of social media marketing today? Scroll up and click "Add to Cart" to get started! 500 Social Media Marketing Tips is supported by over 200 FREE step-by-step social media video tutorials narrated by its author, and that number is growing all the time! Ready to Kick Start Your Social Media Marketing? Join over 40,000 people just like you who are already using 500 Social Media Marketing Tips to make the most of everything that the world of social media has to offer your business. Why spend thousands on a consultant when you can harbor the power of social media marketing today? Scroll up and click "Add to Cart" to get started!